One Pot Greek Lemon Chicken and Rice is so incredibly easy to make that it’ll be your new weeknight go-to meal. Braised greek chicken thighs resting on top of rice with lemons, garlic cloves, spices, white wine, olives, and fresh thyme. The best part? Only one pot to wash when you’re done! 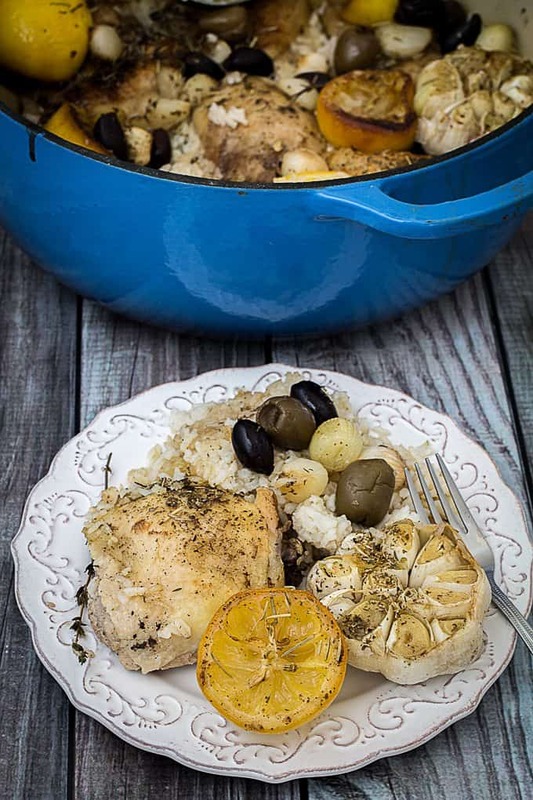 One pot greek lemon chicken and rice is definitely a keeper for the quick weeknight dinner rotation. It’s basically a whole meal in one pot, cutting your clean up time in half. Twice the meal, half the cleanup? Sign me up! Not to mention, it’s really, really, really good. Did I mention that? I’m not sure there’s enough “really’s” in the world to describe how much I like this dish. 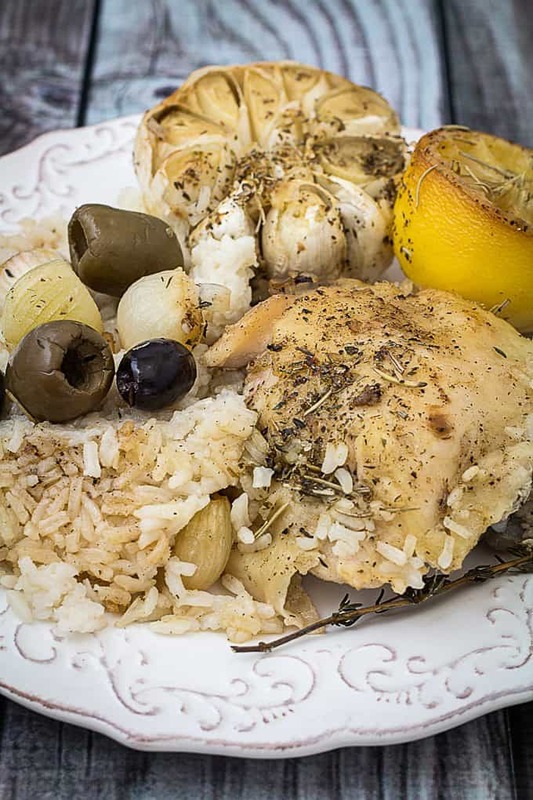 If you like greek food, then there’s a pretty good chance you’re going to like this one pot greek lemon chicken and rice, too. 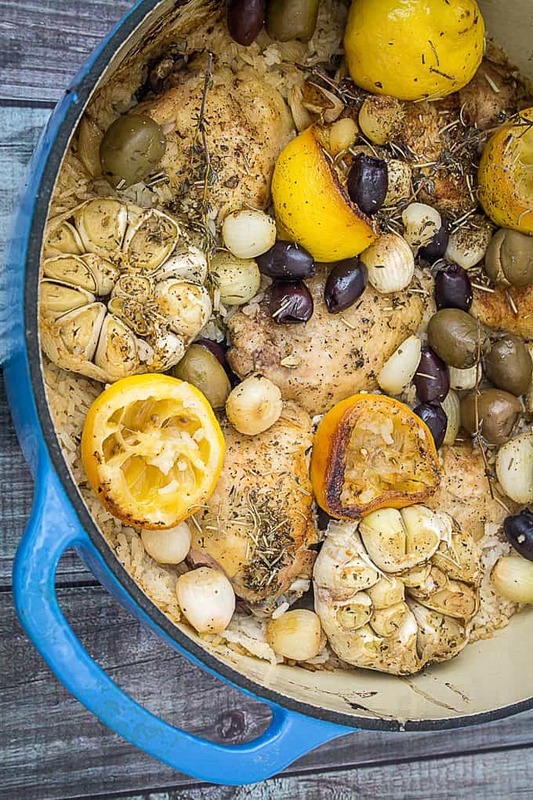 Braised greek lemon chicken just goes really well with the combination of fresh herbs, olives, and white wine. It’s basically a flavor explosion in your mouth. And the best part about all of that fresh lemon-y rice on the bottom? It’s basically sitting there soaking up all of those delicious flavors falling off of the chicken. Oh, yes. Delicious, delicious flavor invasion going on in the bottom of this pan here. I made this over the weekend and am 100% head-over-heals in love with the dish. My original intention was to just make a braised greek lemon chicken. But, after cooking several other dishes, the thought of breaking out yet ANOTHER pot, rinsing the rice, boiling the water, and basically watching it until it’s the perfect fluffy consistency that I demand in my life (ahem – priorities), I decided to just throw some instant rice on the bottom of this baby and see what happens. I do a similar thing in my One Dish Chicken Thighs w/Mushroom & Sage Rice. This is also a staple in my house, but sometimes you need a change. And that change is called one pot greek lemon chicken and rice. And it is probably the best, or at least most delicious, change I’ve had all year. When I was growing up, my mother did not like to cook. Actually, she still doesn’t like to cook, which is ok because I love to cook. When I visit, I try to bring a great recipe with me to share with the family. But, one thing my mother always made was a little something she liked to call “chicken surprise”. It could be a mixture of anything, really. And, um, not always things that go together. Chicken surprise could be anything from chicken and gravy and peas over rice (which I actually like, it’s kind of like a deconstructed pot pie), to chicken in marinara sauce over pasta, to the ever famous chicken with apples and some other random ingredients. Cooked to oblivion, of course. Or, the other possibility was my dad’s grilling, which was a nice break we got when the weather was nice. Dad’s pretty serious about his grilling, you can check out his marinated grilled potatoes here if you don’t believe me. They are the of stuff legends are made of. Except in a marinated potato form, with grill lines. Or, you had to do what I did, and learn to cook. So, here’s a personal shout-out to my favorite cooking instructor, the Food Network. Because they basically taught me how to cook all through high school. This was back when cooking through meals was more popular than reality TV, so you had a lot more opportunity to learn techniques and different dishes. Especially Alton Brown, who actually inspired me to pursue food science. By the way, he puts on a REALLY good stage show, if you ever get the chance to see him! I’m still inspired by his carbonated chocolate ice cream made with fire extinguishers. No, seriously, it was really, really cool. So, whenever I make a new chicken dish, I always spend a little bit of time reminiscing over the many years I spent eating chicken surprise. …And then I cook faster. For fear that it will return. Just kidding. I <3 my mom. Also, I’m pretty sure she reads this. I may or may not be hearing about this later. I should quit while I’m ahead. 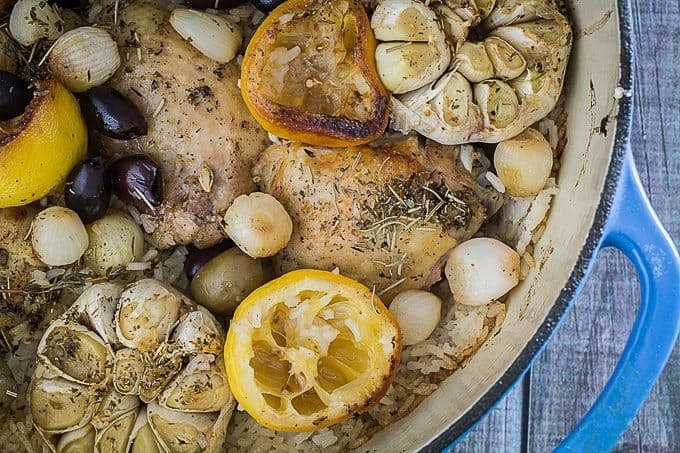 One Pot Greek Lemon Chicken and Rice is Great, But Here’s 4 More One Pot Chicken Dishes! My One Pot Chicken Parmesan is a really great comfort food kind of way to use that penne in your cupboard. 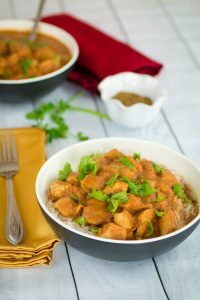 Here’s a One Pot Ragu Sauce Chicken from Peas and Peonies, all you have to do is serve over gluten free pasta. 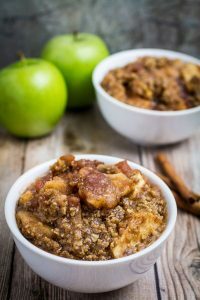 If you want something on the healthier side, you can try this One Pan Baked Chicken Brown Rice Vegetable Casserole from Dinner then Dessert! 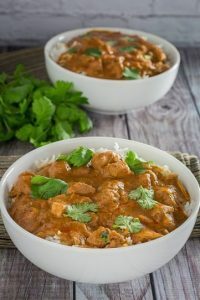 If you like cooking with spices, you would probably like this One Pot Easy Chicken Biryani from Noshtastic. So, there you have it. 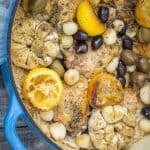 My one pot greek lemon chicken and rice + the super awesome bonus round of almost a week’s worth of one pot chicken dinners! I don’t know about you, but I’m stocking up for the winter. Comfort food is the best kind of food when it’s cold outside. Even though I’m in Florida now, so “cold” really means “50 degrees F”. Which is a HUGE step up from the -20 degrees F it was when I left. Still, if I crank up my AC enough, it’ll feel like winter. 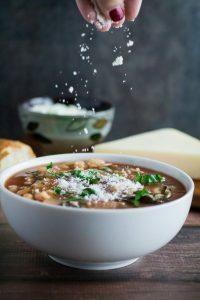 So, we can still be winter comfort food buddies. In a large dutch oven, add olive oil and melt butter over medium-high heat. Add chicken, skin side down, and sprinkle with salt and pepper. Cook chicken until skin has browned, about 5-6 minutes. Turn over and do the same to the other side. Remove chicken from pan and add pearl onions, garlic (open side down), and lemons (cut side down). Add rosemary and oregano. Sauté until onions soften, about 3-4 minutes. Remove onions, garlic, and lemons from pan. Add rice, wine, water, and lemon juice. Quickly stir, then add back in onions, lemons, and chicken. Add garlic (open side up), olives, and thyme on top of rice. Bake 40-45 minutes, or until chicken reaches an internal temperature of 165°F and is no longer pink. 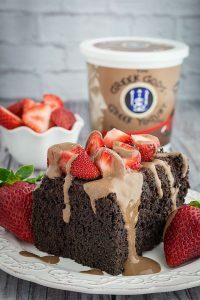 It looks amazing and seems worth to try. And I love the “best part” that you said, to clean one pot only. Definitely gonna give it a try. Sounds yummy! I’m more of a white meat person. 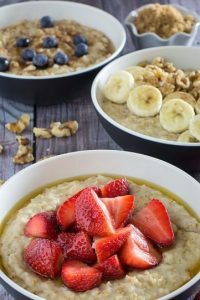 How would the timing change if I were to make this with boneless, skinless breasts? Thanks! The timing should be about the same. When in doubt, I always set the oven timer for about 10 minutes less and check them to see if they need more time. This was made at a dinner party I attended and was a huge hit! 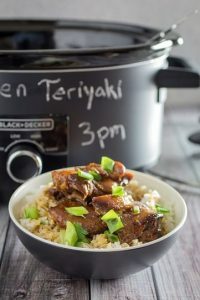 Do you think this would work with regular rice instead of instant? 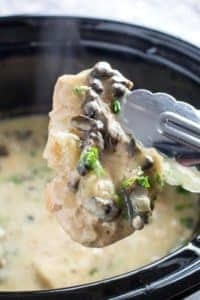 Should I modify the recipe? Thank you in advance!